DRIVERFighter Review and Giveaway Ends 12/30! 3 Winners! Did you know that the drivers on your computer need updated? I am sure that you did, like me, but never think about doing it, right? Do you even know how or where to go to check if your drivers are up to date? I sure don't have time to remember to update drivers on my computer and sure do not have any idea how to find out if they are up to date and where to download updates! This is where DRIVERFighter comes in. DRIVERFighter is an easy to download software program that will find any outdated computer drivers you may have AND will find and download the updated drivers for you! Whole Fruit Sorbets are made with chunks of real fruit and bursting with a refreshing taste. Whole Fruit Sorbets are an award-winning member of the Whole Fruit Line by J & J Snack Foods. Available in five flavors: Mango, Black Cherry, Raspberry, Strawberry, and Lemon. Voted Best Flavors by Cooking Light Magazine! WHOLE FRUIT Lemon and Mango Sorbet are bursting with award-winning refreshment. Kindle Fire & $40 Amazon.com Gift Card Giveaway! Enter for your chance to win a Kindle FIRE! It would make a fabulous gift!! Delightfully has teamed up with Happy Mothering and Green Moms Media to bring you a giveaway of a Kindle Fire and $40 Amazon Gift Card to spread the word about their new virtual gift-wrap service! Think about how many gifts are given online now, between music, gift cards, subscriptions, e-books… I’m sure you’ve sent at least one online gift – and likely will again before Christmas. Delightfully is a new service that allows you to hand-wrap your online gift! With Delightfully, you can create the perfect ‘unwrapping’ moment for any gift occasion. Say goodbye to wasteful paper and tape and say hello to this eco-friendly gift-wrap alternative! iPad Mini Giveaway! Ends 12/5! Open WW! iPad Mini Giveaway EventHosted by Mom Powered Media Please take a moment and visit our sponsors: Coupon Pro and Penny Auctions Canada! Coupon Pro is your daily money-saving blog for the hottest freebies and coupons from top brands. We want to help you save the most on everyday items your family needs. Join us today! Penny Auctions Canada is an online auction website that lets you buy awesome products for pennies! The iPad Mini has a beautiful display, powerful A5 chip, FaceTime HD camera, iSight camera with 1080p HD video recording, ultrafast wireless, and over 275,000 apps ready to download from the App Store. The iPad mini is an iPad in every way, shape, and slightly smaller form. Easy for on the go with that same great Apple power punch! An iPad mini would make a great gift, even for yourself! Beauty Stop Online is located in California and is committed to providing high quality name brand beauty products to you at low prices. They sell nail polish, flat irons, hair dryers. shampoo & conditioners, cosmetics and much more. They sell all the brand names you know and love but their prices are much less expensive. 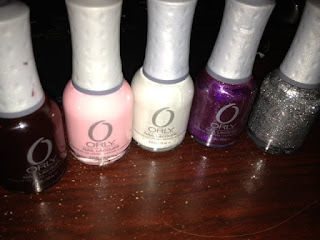 They sent me some Orly nail polishes for review. I love nail polish and know that Orly brand is one of the best but it tends to cost a bit too much for my taste. I don't know about you but $10.99+ for one polish is too much. Beauty Stop Online sells them for just $6.50+! I received 5 different colors that I got to personally pick out. "Naughty" - is a very dark red color but is very rich. It reminds me of a red wine. "Pink Slip" - is a milky pink. It goes on almost opaque but it's not so opaque that it cannot be seen. For more of a pink, just add another coat or two. iPod Touch Giveaway! Ends 12/17! Thank you for joining us for the iPod Touch Giveaway event, hosted by Happy Mothering and Green Moms Media and sponsored by LampsUSA.com and EarnSEO.About LampsUSA If you’re looking for new home lighting, check out LampsUSA.com. They have been selling quality discount lighting online since 1998 and in brick and mortar stores since 1994. They guarantee the lowest price on everything they sell and offer free shipping on orders over $79! Plus you pay no tax if you’re outside of California or Wisconsin! Blankz Toy Giveaway Ends 11/26! US Only! 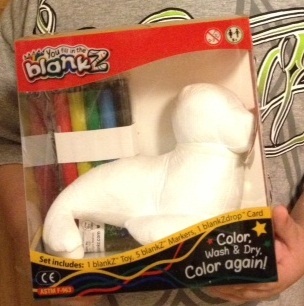 BlankZ toy is a fun toy that your kids will have fun for hours. Here is your chance to win one! Just on time for Christmas. This giveaway will be from November 12 to November 26, 2012. This would be an excellent Christmas gift for a child! Get them away from the TV or computer and let their creativity come alive! The winner can pick their favorite blankZ Toy. 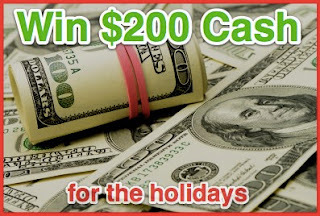 $200 CASH Giveaway!! US and Canada! Ends 11/22! One lucky reader will win $200 Cash to spend on holiday shopping or however they wish. The cash prize will be delivered via PayPal. You must have a PayPal account in order to receive your prize should you win. Come back daily for extra entries. Disclosure: I was not compensated in any way for participating in this giveaway with Tip Hero. Just the Two of Us and Deals is NOT responsible for prize fulfillment. It's definitely Fall here in Pennsylvania! The leaves are colorful and falling and the temperatures are much colder than they have been. I miss Summer already but thanks to Daily's Cocktails, I can still be reminded of how great Summer is. When I think of Summer, I think of sitting on a sandy beach with a nice cocktail in my hand. I was given the chance to try a few of Daily's Cocktails frozen pouches. I admit, I am not a huge drinker but when I do drink, I enjoy mixed drinks the best. When I saw that they had Strawberry Daiquiri and Peach Daiquiri, I was excited!